Ray White Commercial Northern Corridor Group is pleased to offer to the market 314 Gympie Road, Strathpine. 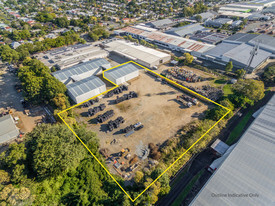 The site provides a unique commercial or retail opportunity in the heart of one North Brisbane and Moreton Bay's leading regional commercial centres. Located on Gympie Road directly opposite the Strathpine Centre which attracts approximately 5.5m customers per annum, the site has retail exposure to over 35,000 cars per day. 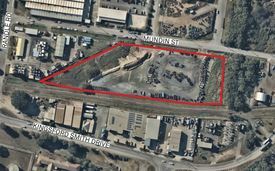 There is significant scope for commercial and retail uses; bull; Total land area of 4,411 sqm ; bull; 50.8 metres of Gympie Road frontage; bull; Dual street access to Gympie Road Railway Avenue; bull; Existing 500 sqm of building area including showroom, offices and warehousing area; bull; 400 metres from the Strathpine Railway Station; bull; Current Primary Use for Outdoor Sales Area for Dealers, Cars, Boats etc; bull; Potential for redevelopment for variety of commercial or retail uses; bull; Motivated vendor looking to do a deal quickly. For more information or to arrange a site inspection, please contact agent Peter Laurent from Ray White Commercial. approximately This property is being sold without a price and therefore a price guide cannot be provided. The website may have filtered the property into a price bracket for website functionality purposes. 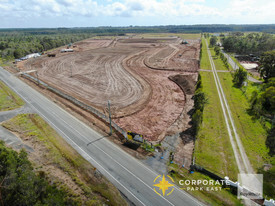 bull; Pinkenba Areas from 4,000m2 1.75ha bull; Dry yard with road base compact bull; Competitive rental bull; Convenient location bull; Call Today Located within Brisbane's Trade Coast precinct offering ease to Motorway and to Port. For further information or to arrange an inspection contact Juma Marstella on 0450 360 321. 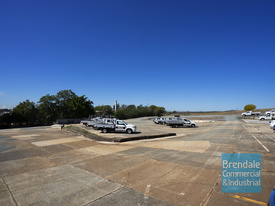 2,000sqm 10,977sqm hardstand for lease Compacted level road base Site is fenced gated Exposure to busy Lytton Road Services can be negotiated subject to the owner's approval Approximate dimensions of 40m x 275m ( approx.) For further information or to arrange an inspection please contact Jared Doyle or Jack Gwyn of Ray White Commercial TradeCoast! Secure Industrial Hardstand $1,850 P/M incl. GST and .. Secure hardstand is now available for lease at Corporate Park East with options from 1,000m2 to 20,000m2. 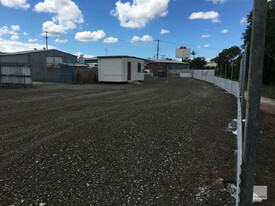 Features include: Crushed rock all weather hardstand Security fencing with lockable gates Power and water available Exclusive use, no shared access Short or long term Additional improvements are available including temporary office/amenities, or purpose built warehouse or workshops. Call today to discuss how we can accommodate your specific needs. Secure Industrial Hardstand $11,000 P/M incl. GST and.. Secure Industrial Hardstand $3,700 P/M incl. GST and ..
Ray White Commercial North Coast Central is pleased to offer 4 38 Grice Street, Clontarf for lease. 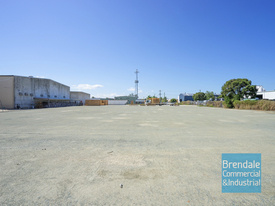 Features: 1,300m2 hardstand 100m2 shed on site Fully secure gated complex Power/water available Easy access for trucks and heavy machinery For further information or to book an inspection please contact Aaron Canavan or Chris Massie. 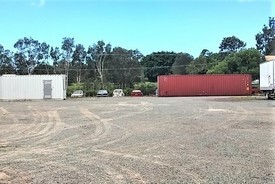 8,500sqm hardstand Area and access point can be increased in size if required Fully fenced site Access to power water if included Available now Fantastic location being just 600m from the Gateway Motorway Port of Brisbane Motorway and just 150m from the Murarrie Train Station 2,813sqm office/ warehouse also available for lease onsite Great value at just $130,000 p/a + GST Gross! ( approx.) All outlines are indicative only. For further information or to arrange an inspection please contact the Exclusive Marketing agents Jack Gwyn or Jared Doyle of Ray White Commercial TradeCoast Today! 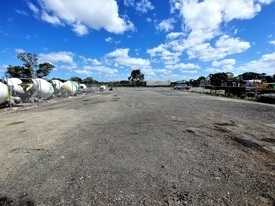 Light Industry zoning Setup for Earth moving Business Massive compacted hardstand all usable 4,402m2 Site Front office 18m x 7m + Work Station 12m x 7m Fully fenced site w security monitoring system Approximate Areas Incentive for first year based on 5 year head term lease with rental going to market $85,000 from year 2 onwards. 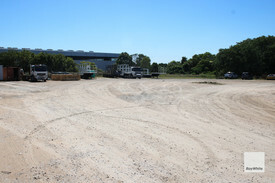 Hardstand available from 1,000m2 to 2,000m2 Compound is fully fenced however owner will build fence to suit Perfect for trucks or transport or just storing containers Positioned off Bribie Island Road Contact The Commercial Guys today to arrange your inspection or for further information. Unless otherwise stated, the price/property may be subject to GST and/or outgoings. Hardstand Available On Bribie Island $2,077.50 per month (incl..